The Best Summer Shoes For Kids- Get Them Ready For Summer Camp! Have you been looking to keep your kids’ feet and legs healthy during the summer? Did you know that there are certain summer shoe styles that will provide more comfort, support, and protection to your kids’ feet? Summer time is approaching and it’s time to find good summer shoes for your children to be able to run and play comfortably. Parents tend to choose summer shoes that are durable (so their kids can wear them for the whole season), dry fast, and offer good support. Did you know that during the summer is when children tend to develop more foot issues such as blisters, calluses, and corns? All of these issues are directly related to the shoes that they wear. I know exactly which summer shoe styles are better than others from having fitted them myself. When choosing sandals for your little ones you must avoid low quality materials such as plastic. Plastic shoes or sandals don’t allow feet to breathe and can worsen sweating in the feet and create blisters. Remember that your children are going to wear these sandals for the entire day and participate in extensive outdoor activities during summer camp. There are certain sandals that come with hard and inflexible soles which pose a threat to growing children. Some parents see shoes as a pretty basic thing, and don’t feel like they need to devote much time finding shoes that properly fit their kids’ feet. Providing your child with the correct pair of shoes will actually end up saving you a lot of time and money in the future. Summer is knocking at the door and if you are looking for the best type of summer shoes for your kids, I will describe the most durable, supportive, and best fitting ones shortly. Please keep in mind that these styles are going to fit the shape of a child with narrow, medium, wide, or extra wide feet. I will provide you with the best 3 summer shoe brands for children and the best shoe styles among those brands. Summer is one of the most fun and exciting times of the year for children and we sure want to make it special for them. You probably have heard about Keen sandals before. They are the #1 choice of summer footwear for children. However, there are certain styles that are more durable and supportive than others. Keen is one of the leading shoe brands for children and their sandals have received some of the best reviews from parents over the last 10 years. Keen sandals are definitely one of the best summer shoe choices for children. Parents love to provide children with Keen sandals because they are practically indestructible and they provide great support and stability. Keen sandals come with a thick rubber sole and a rubber toe-box specifically designed to protect your kids’ toes. They also come with a Velcro closure with a toggle shoe lace ensuring that children can put them on and take them off easily. They provide excellent traction to minimize the chances of your child from slipping and falling down. Parents love how versatile these sandals are. They will protect your kids’ feet everywhere they go for their summer adventures, be it rock climbing, wading through streams or stomping in mud. These sandals are available from toddlers’ sizes all the way up to your teenage children ,with new colors and styles for every season. So if you are looking for the perfect pair of summer shoes for your child to wear to summer camp, you have found them here, they’re called Keen sandals. The more popular Keen sandals styles are the Newport, the Seacamp. the Uneek, and the Moxie style. All of these styles will fit a child with wide feet, but they won’t fit a child with extra wide feet. All of these shoe styles fit “true to size”,which means that you need a half a size longer to a whole size longer of the size that your child measures in the shoe measuring scale in order to allow for growing room. These are both great choices your children to wear during summer camp, especially if your children have wide or extra wide feet. Both of these shoe brands are known for creating premium summer sandals, providing safety during your kid’s adventures, whilst ensuring durability and coziness. Their designs are simple but versatile. Parents particularly adore these brand because the shoes are very easily washable. Keen sandals are known for smelling bad, but you won’t have to worry about your kid’s sandals developing a smell with these two shoe brands. These sandals provide the same structure and support as Keen sandals do, but they fit much wider. Besides fitting children with extra wide feet, these sandals stay on the feet easily, provide sufficient room for the toes to spread out in the front, and come with extra padding around the heel area to prevent blisters. The cushy foot-bed makes it comfortable to walk and run around while the extensive traction in the rubber sole minimize the chances of your child from slipping and falling down. Here is a couple of pictures of how these sandals look like. They come with a Velcro strap just like Keen sandals do. These shoe styles fit “long”,which means that you need to go a half a size longer of the size that your child measures in the shoe measuring scale in order to allow for growing room. I am always emphasizing to parents that it doesn’t matter how many features a particular shoe style provides, if you don’t provide your child with the correct shoe size, your child won’t get any of the benefits that the sandals have to offer. Which bring me to this next question: Are You 100% Sure of Your Child’s Foot Size? If you are providing your child with shoes that are too short, too long, too narrow, or too wide for your kids growing feet, you may cause several foot problems such as blisters, calluses, corns, ingrown toenails, just to name a few. Your kids’ shoes must fit just right! The main reason why I recommend these three shoe brands is because they all provide great durability, support, stability, and comfort. Keen sandals are the best choice when it comes to your kids’ summer sandals, but they won’t fit a child with extra wide feet, which is why I provided you with alternatives. 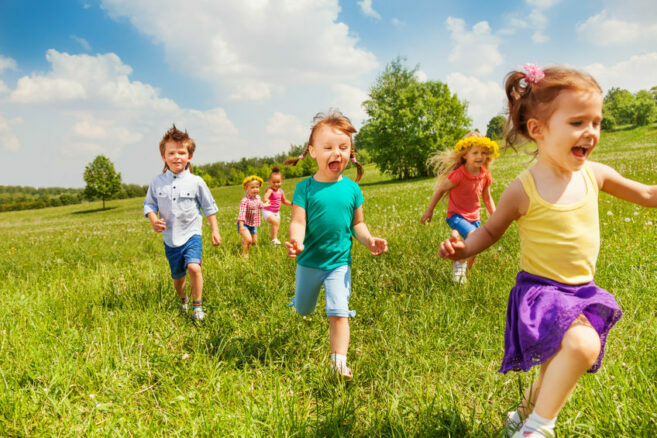 While some parents do understand the importance that shoes play in keeping their kids’ feet and legs healthy, others do not, and most of the time it is a lack of awareness that shoes play a big role in kids’ everyday lives. Do Kids Also Need a Pair of Sneakers for Summer Camp? – Let’s Find Out! Most children do need to take a pair of sneakers to wear at summer camp. Children play and get involved in all sorts of different activities like pick-up soccer games, volleyball, tennis. Sneakers will support and protect their feet during all of these activities. Did you know that a child’s foot sweats about 2 to 3 times more than the average adult foot? This is one of the main reasons why kids’ shoes wear down faster than those of adults. However, sweat is not only a concern for the durability of the shoes but also for the health of children’s feet. Sweaty feet are vulnerable to feet fungus, rashes and infections. This is why you must provide your children with breathable shoes, which will allow the moisture and heat to escape from your children’s feet, letting cool air in. The feet of children are known to withstand three times more stress than adult feet. This is because of the children’s high level of activity, especially during experiences like summer camp. Because children’s feet endure high stress, children must wear shoes with good shock absorption, a well-made foot-bed, and durable soles. Flexibility should also be imperative for your children’s shoes because it helps kids strengthen the muscles of the feet on their own. Washable Shoes For Kids – The Best Shoes To Stop Smelly And Sweaty Feet! Being a parent is hard. Ensuring the best for your child is even harder. But we all know, our children deserve the best!. I provided you with a selection of the best summer shoes for kids so you can keep their feet and legs healthy during the summer. What type of summer sandal do you typically provide for your child? Is there a particular sandal you can recommend for summer camp? Please share your thoughts and experiences below so other parents can benefit from them.